Ann Taylor is an American apparel retail chain for women headquartered in New York City. With multiple collections, this store has a wide range of high-end and business casual apparel including blouses, dresses, pants, and more. The elegant and modern style has gained popularity worldwide. With Big Apple Buddy’s personal shopping service, you can now buy direct from the Ann Taylor online store anytime, anywhere. 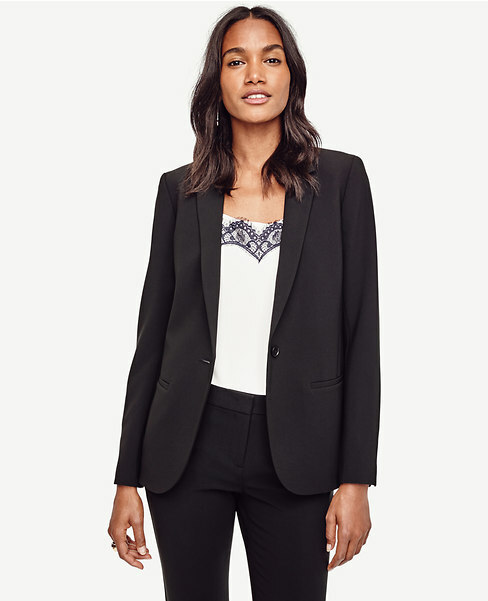 Bring business to the room with the Triacetate Midi Blazer from the Ann Taylor collection. This stylish blazer with a sleek design, accentuates your form and maintains professionalism when you need it. Combine it with any color shirt or blouse as you go with the Black or Winter White Midi Blazer. It even has pockets so you can keep your most essential items close to you and sleeve buttons for your styling options. Looking for that hot new summer dress? The Crosshatch Tweed Flounce Dress is one of the favorites of the Ann Taylor collection. With a daring v-neck and sleeveless style, this dress is perfect for a fancy night out! The unique pattern is classy yet modern with a black and white combination that will go with anything. Meanwhile, the hidden back zipper guarantees a flawless look from every angle. Don't miss out on Ann Taylor's Cotton Twill Utility Jacket! Whether you're wearing a dress, shirt, or blouse underneath, this jacket provides the perfect amount of coverage so you can still show off your outfit but stay cozy. The flap patch pockets are the only pockets you'll ever need! This jacket is not only sleek and fashionable, it's also convenient when you have too many things to carry with you. Unfortunately, the USA Ann Taylor online store does not currently offer international shipping. However, Big Apple Buddy, your personal shopper, can help you buy products direct from the official USA Ann Taylor online store and ship them to your doorstep, no matter where you are in the world. We offer international shipping to over 110 countries including Australia, Austria, Azerbaijan, Bahrain, Belgium, British Virgin Islands, Brunei, Bulgaria, Canada, Chile, Costa Rica, Croatia, Czech Republic, Denmark, Estonia, Fiji, Finland, France, French Polynesia, Germany, Gibraltar, Greece, Greenland, Hong Kong, Hungary, Iceland, Indonesia, Ireland, Israel, Italy, Japan, Jordan, Kuwait, Latvia, Liechtenstein, Lithuania, Luxembourg, Macau, Malaysia, Maldives, Malta, Marshall Islands, Mauritius, Monaco, the Netherlands, Netherland Antilles, New Zealand, Norway, Oman, Poland, Qatar, Romania, San Marino, Saudi Arabia, Serbia and Montenegro, Seychelles, Singapore, Slovak Republic, Slovenia, Spain, South Africa, St. Lucia, Sweden, Switzerland, Taiwan, Thailand, the UAE, the UK, Vatican City, and Vietnam. If you would like to buy from the USA Ann Taylor online store, simply let us know which items you would like to order (by filling out the form below) and we’ll get back to you with a free international shipping quote within 24 hours!